The Italian island of Sardinia has more than 1,000 miles of stunning Mediterranean shoreline and is known for having some of the best beaches in Italy. While nearly every section of the island can lay claim to some great beaches, some are easier to reach and better equipped for families or first-time visitors. Here are five of our favorite beaches on Sardinia. If you want atmosphere and activities, Poetto beach, a city beach on the outskirts of Cagliari, hits the spot. Poetto is popular with locals and tourists alike and is easily reached from the city center by a short bus ride. On weekends and in summer the wide stretch of white sand is packed with sun worshipers in search of anything from a lazy day to extreme water sports like kite surfing. Poetto beach is separated from the city by a strip of undeveloped land giving it a clean, open feel. Overlooked by its namesake, Torre del Poeta or Poeta tower, it's a great place to while away a sunny day. The beach also has a popular surf spot on the well-exposed beach break with reliable waves driven by an offshore wind from the north and northwest. There are plenty of surfing spots along the 3.7-mile-(6-kilometer) long city beach which are perfect for beginners. At Poetto Beach there are several places to stay. Cagliari, on the southern coast, is Sardinia's largest city and has both an airport and ferry port. A short bus ride from the city of Alghero brings you to this well-kept local secret. While tourists squeeze onto Alghero's port-side beach, those in the know head to La Bombarde, where snow-white sand infused with the scent of the surrounding pine forests awaits. The sea at la Bombarde is clear, blue and calm, perfect for swimming. The beach has just the right balance, never over-crowded but still lively, with a number of cafes and restaurants. Alghero, a city founded by the Doria family of Genoa, is located on Sardinia's northwest coast and is one of the most attractive resort areas in Sardinia. Holidays in Alghero have become more popular in recent years although the city still retains its distinctive Catalan character. The dunes at Piscinas are reached by car, down an old gravel road from Arbus. Along the way, you pass the remains of 19th-century mines before arriving at the uninterrupted five miles of sand. There is an aspect of wildness to the beach and it is home to everything from foxes to sea turtles. The dunes reach up to 50 meters high as the mistral winds constantly move and reshape the landscape, making for an exciting day out. Arbus is in the southwestern part of the island, south of the city of Oristano, and the dunes are on the west coast near Marina di Arbus. The pink granite boulder-strewn coves at Spiaggia del Principe, developed in the 1960s by Prince Karim Aga Khan, are know for the stunning clear blue water that is perfect for snorkeling and fish spotting. The beach is a perfect crescent of fine sand enclosing a blue-green bay. All the beaches in the area are public access so there are no fees. The Costa Smeralda region, favored by the rich and famous, is located on Sardinia's northeast coast, 30 km north of the port city of Olbia. Costa Smeralda is made up of 80 bays and beaches, most of them are best reached by boat or yacht. Visitors can select from a large range of luxurious 5-star resort hotels around Porto Cervo, such as these luxury hotels listed on Charming Sardinia. The town of Porto Cervo was created in the 1960s by Prince Aga Khan, who was fascinated by the beauty of this stretch of Gallura and set up the Costa Smeralda Consortium to help enhance and maintain the natural beauty of the area. Cala Luna is located near the coastal resort of Cala Gonone, on Sardinia's east coast. Cala Gonone is within close proximity to the town of Dorgali and Gennargentu National Park. The beach itself, featured in Guy Ritchies' 2002 film "Swept Away," is known as Moon Cove due to its crescent-shaped white sand beach and dramatic cliff backdrop. Accessible by boat or on foot, the picturesque beach is sheltered by limestone cliffs, fuchsia, and oleanders. Getting to the beach is somewhat of a commitment, however, as it requires a strenuous 2.5-mile (4-kilometer) hike on a trail from Cala Fuili. 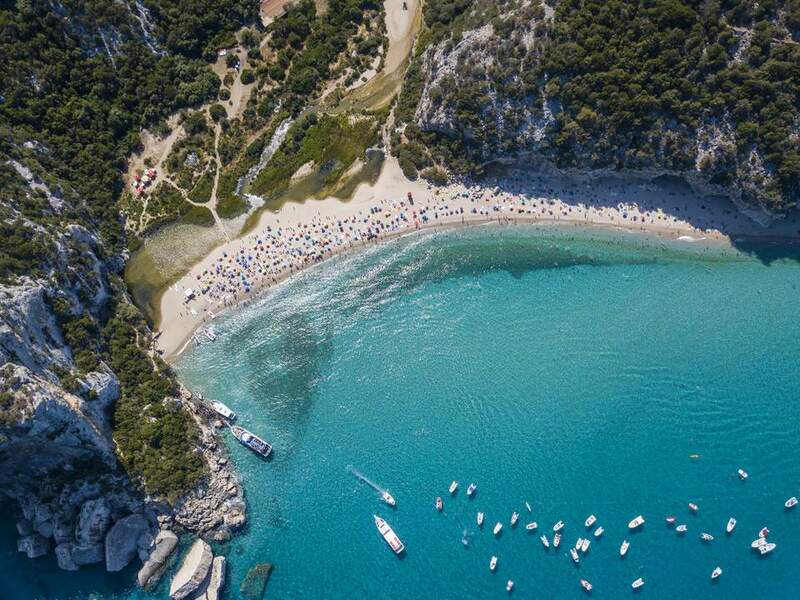 The beach can also be reached by ferry from Cala Gonone during summer. There are several 3- and 4-star hotels in Cala Gonone. Read more about the best beaches on this stretch of Sardinia's Gulf of Orosei. While most beaches on the island of Sardinia offer free access, some have private bathing establishments where you will have to pay to rent a lounge chair and umbrella. What Are Sardinia's Stone Towers All About?